Promising to bring more colour in my wardrobe has been more than difficult for someone who owns a mainly black, grey and white wardrobe. But I have re-found my outfit inspiration, so there are going to be more exciting post to come! I've already started to plan my summer and holiday wardrobe which contains some wedding outfits. My 'save for later' list on Asos has been increasing daily, I'm so excited for spring/summer to come around. In this outfit I wore a off shoulder berry toned top which has slits down the arms. Off shoulder are going to be a main trend this Spring/Summer so keep a look out for some exciting pieces, I already have my eye on a Zara one. I wore my trusty faux leather pants from River Island which are high waist and a faux fur sleeveless blazer from Topshop featured in: The Wardrobe Edit and Going Tribal. 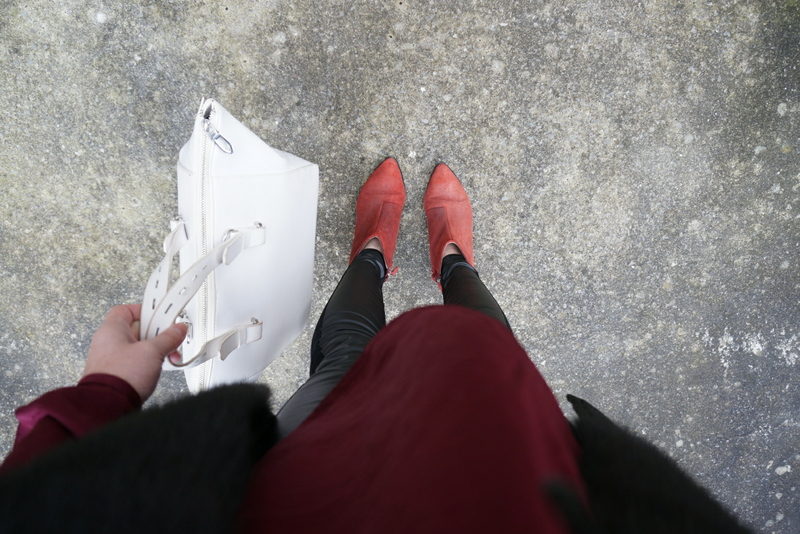 For accessories I completed the look with my red Zara Suede boots and a white Zara shopper bag for contrast. I'm loving this easy outfit for a casual day shopping indoors. That's a really cute look, berry tones never die out!